AFTER picking up two first place titles at this year’s World Lyrical Dance Championships it did not seem that things could get much better for Turf Lodge dancer Chloe Montgomery. That was, of course, until her mum Noreen became the mummies world champion that same weekend. Having travelled to Stratford-Upon-Avon for the competition on July 28, 12-year-old Chloe and her team took the Royal Shakespeare Theatre by storm. The girls at Colleen & Co won an astounding nine world titles, with Chloe herself putting in world champion performances in the under-14 team and duo events. Not one to shy away from a bit of craic, 41-year-old Noreen Montgomery picked up a ninth title for Colleen & Co after entering the mummies solo competition at the last minute. 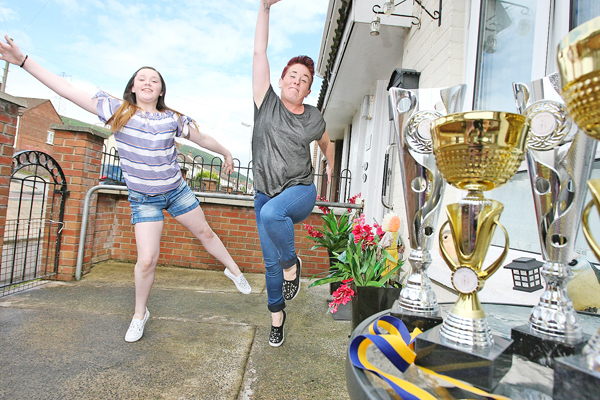 Speaking to the Andersonstown News, young Chloe said that she was “very proud” to see that her team’s efforts had paid off at the World Championships. “I started crying when we won,” she said. “I feel like it just gets to you because of all the hard work. It’s good to win after all the effort and I’m very proud. We have all different age groups and its really good fun. There are a few arguments because we’re all together for four hours straight sometimes, but we always get there in the end. Reflecting on the team’s successes, Noreen said: “It was wonderful to see Chloe and the rest of the teams win. It was a very stressful weekend – we were up early in the morning and the days were very long. I’m very proud of her. The team is now in preparation for the All-Ireland Lyrical Dance Championships in February 2018 and Chloe believes they can bring even more titles home to West Belfast.